Your support has made all the difference in their world. Women at the Karuhaya-Kuntatemwa project celebrate the completion of the first tap stand. Women and children are usually tasked with fetching water for their families and are most impacted by the completion of a water system. We are excited to share the latest updates from our two current projects, fully funded at the 2017 Spring for the Water. Thank you for helping us transform lives forever. Once completed this project will impact 1,800 people. 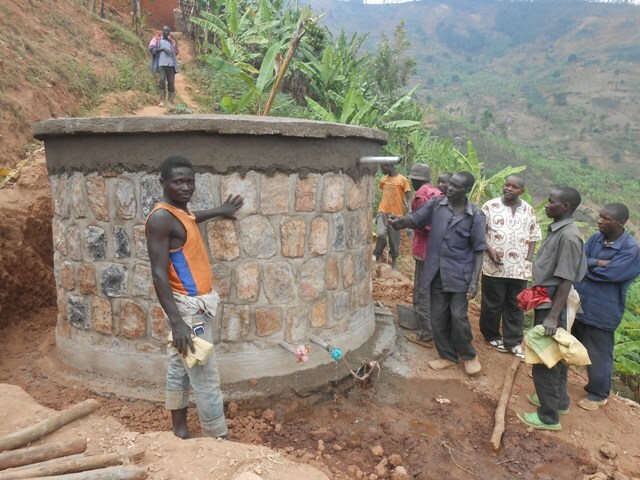 Construction of a water project serves as a powerful way to unite local communities. With one collection chamber and one tap stand already completed, time once spent collecting water can now be used towards improving the community. Local workers are employed to dig the trenches for the pipeline that will stretch a total of 2.9 kilometers. In a country devastated by high unemployment, these jobs are as vital to the community as the water projects themselves. Workers report using their salaries to purchase additional livestock, build better homes and send their children to school. In the absence of modern construction equipment in rural areas, trenches are dug and tanks are constructed, all by hand. The average distance a rural Burundian walks is 4 miles a day just to have access to contaminated water. Completion of this project means 2,800 people, including 350 parishioners and 312 school children, will travel a quarter of a mile and have access to clean water. With the collection chamber and the first of 12 tap stands completed, this rural community now has access to clean water not just for drinking, but also for laundry and bathing. Disease in rural communities is rampant, but with the ability to tend to basic hygiene, the overall health of a community is drastically improved.